The beginning of an incredibly strange set Amy Winehouse did at the start of her European tour in Belgrade’s Kalemegdan Park. As you can see, she immediately hugs the guitarist, appears a bit dizzy, takes ages to take off her shoes for no apparent reasons, tosses a shoe on one of the backing vocalists and delivers a half-spoken version of Just Friends. I sure as heck hope she’s OK. This was heartbreaking. 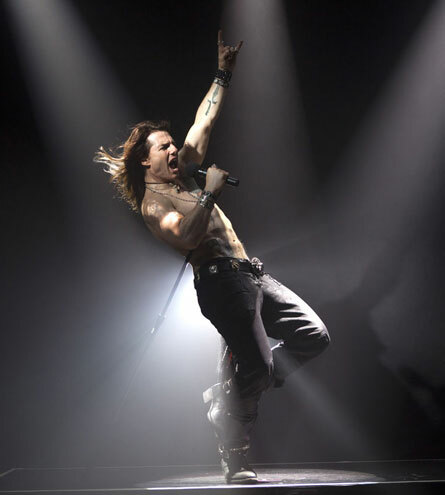 This is the first picture of Tom Cruise as Stacee Jaxx in the new movie, Rock of Ages, which is based on the best-selling broadway musical of the same name. The movie is currently under production, and will be shown summer of next year. Alic Baldwin, Russell Brand, Catherine Zita Jones, and Mary J. Blaije are all on the movie. This is Angelina Jolie’s ad for LV, and she’s not wearing any makeup, and it’s shot on location in Cambodia where she does a lot of charity work. And she’s wearing her own clothes too! She looks great mashalla. Related: Lady GaGa falls down and some other very funny fall.